WHY the FD-M4 and PA-M4? This system, using Fully Discrete technology, is incredible. 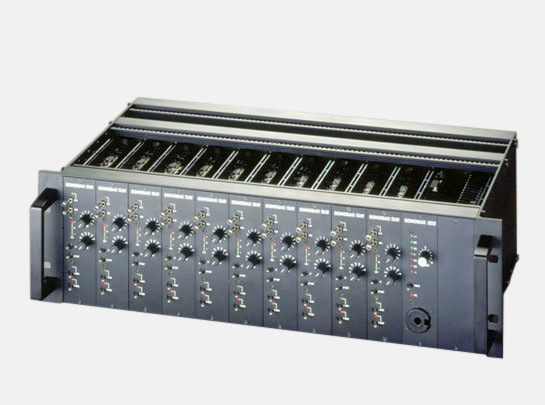 For certain applications, such as fixed distribution or public address systems, we also created the PA-M4. This card is a simplified version with only two gain possibilities: unity gain and +10 or +20dB gain (user selectable). These three cards and different variations are compatible, and the user can chose between these basic alternatives, mixing different cards in the same system. We already plan to extend the system with FILTERS, EQUALIZER, DYNAMIC PROCESSING unit, and then the FD/SX/PA system is really ready for the future! With the purchase of the FD-M4 series, the user can remain confident that this system will continue to lead the field over the next few decades with its superior technology. Following the advent of the operational amplifier (OP), an inexpensive component, easy to use, with low power consumption, we, as other manufacturers, have probably fallen into the trap of using these components in great profusion. These do however make it possible for us to develop highly complex equipment at reasonable prices. These circuits, although very useful for certain applications, contain a great number of semi-conductor junctions, on a very small silicium surface and, therefore have limited characteristics. To overcome these limitations, and after extensive tests and comparisons between all-transistor circuits and integrated Ops, we decided to develop our own OP containing discrete components only. Comparisons made with measurements showed little difference, but auditive tests were definitely superior and in favor of the transistor circuits. It should however be noted that our all-transistor circuit uses approximately 5 times more power than an integrated circuit, has innumerable components and can be up to 100 times more expensive! Execution is in the form of an SMD (surface mounted device) module which means that it can be used in various appliances. Maintenance is facilitated by a standard exchange of the module. Using FD Ops has enabled us to realize a mic/line pre-amplifier with exceptional characteristics. With only 3 transistor stages, the gain is adjustable from 0dB (unity gain) to 80dB, with noise features close to theoretical limits in all gain positions. The stability per gain unit, without using a PAD, allows a signal to noise ratio superior to 130dB, which is an improvement of 20dB over current pre-amplifiers! In this days when microphones have potential dynamics of nearly 130dB, and with certain manufacturers of tape recorders announcing new digital recorders with dynamics of more than 120dB, we must be able to offer such performance. The slew rate is 40V/µsec. which is 10 to 100 times superior to systems presently available. Bandpass at 60dB gain is superior to 150kHz, to allow correct phase response. A probable return to acoustic instruments, rich in harmonics and “warmth”, fully justifies this type of circuit. Encouraged by our position as leader in the creation of high quality microphone pre-amplifiers, we decided to make this first application ourselves.